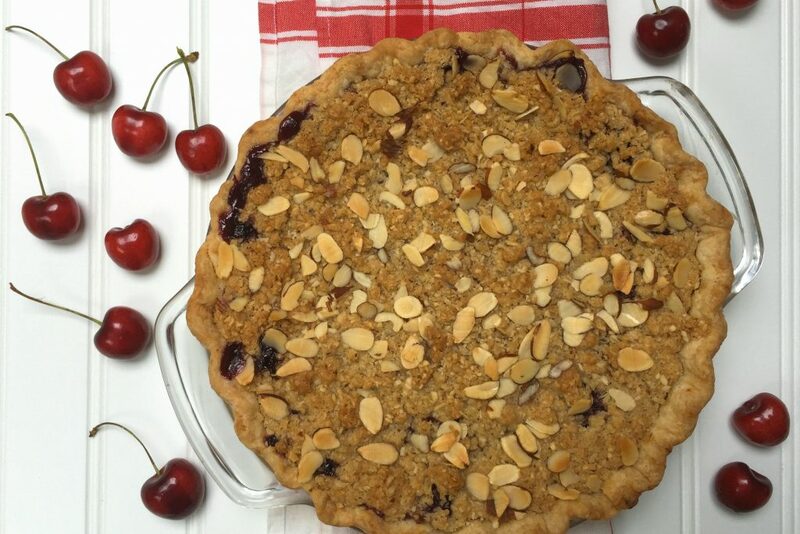 Cherry Pie and summer just go together. It’s the dessert you just expect to see gracing the picnic table at a family cookout. Everyone wants a slice. That’s why when the month of June finally rolls around and I start to see those beautiful ruby reds at the market, my thoughts instantly run to pie. No matter what, I have to make at least one cherry pie every summer with those gorgeous gems. 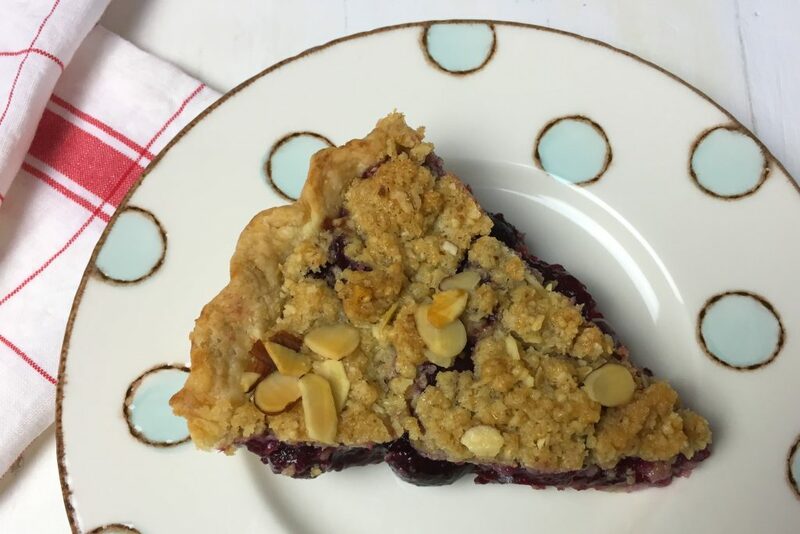 I particularly love this recipe for Cherry Crumb Pie with Almonds and you will too. 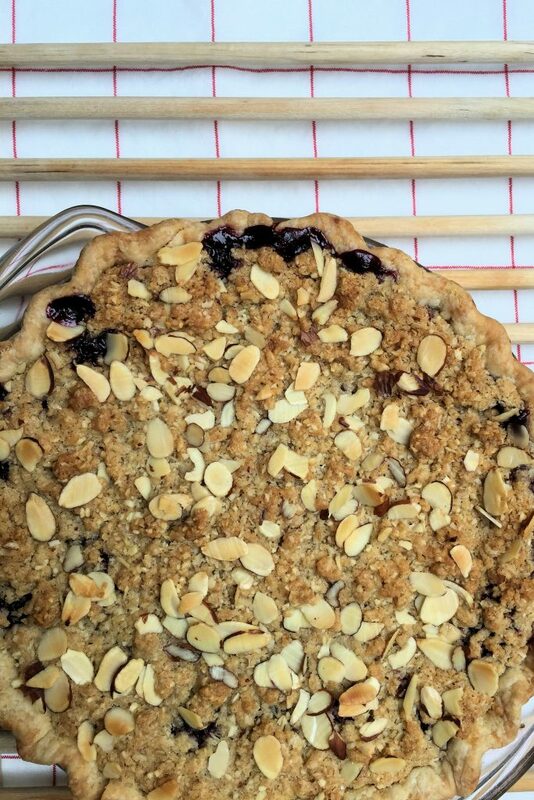 When I was trying to take pictures of this pie, I realized that if I had made a cherry pie with the traditional lattice on top, I would have found the task so much easier. The lattice top cherry pie is instantly recognizable as a cherry pie and it is so darn pretty with the colorful red cherries showing through. The perfect subject for food photography. The crumb topping on the other hand, well…. is a bit harder to work with. You really just have one color going on. 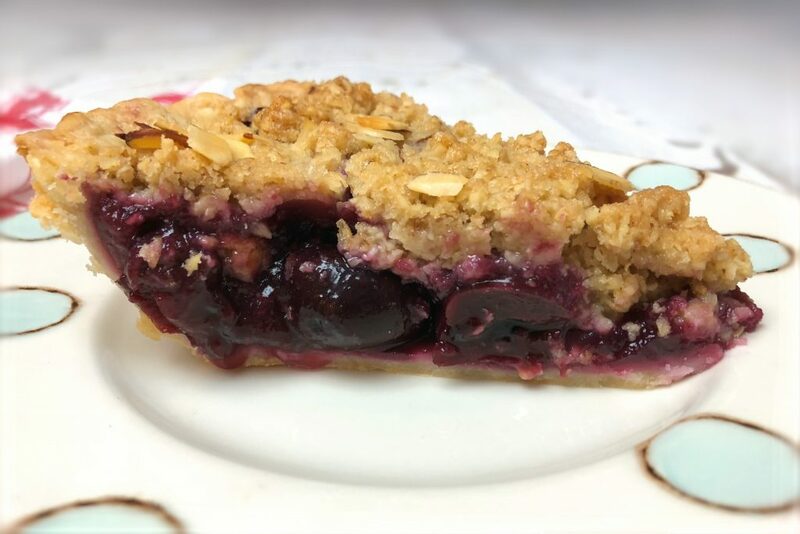 But the thing is, a cherry pie with a really good crumb topping (such as this), tastes better than the one made topped with the lattice pastry crust. This has been determined by a scientific survey of everyone in my family and the occasional passing neighbor. It’s just that there is so much more going. 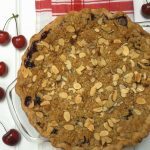 The different lovely textures along with the intriguing flavor notes really put this delicious cherry crumb pie over the top. A couple of little things. 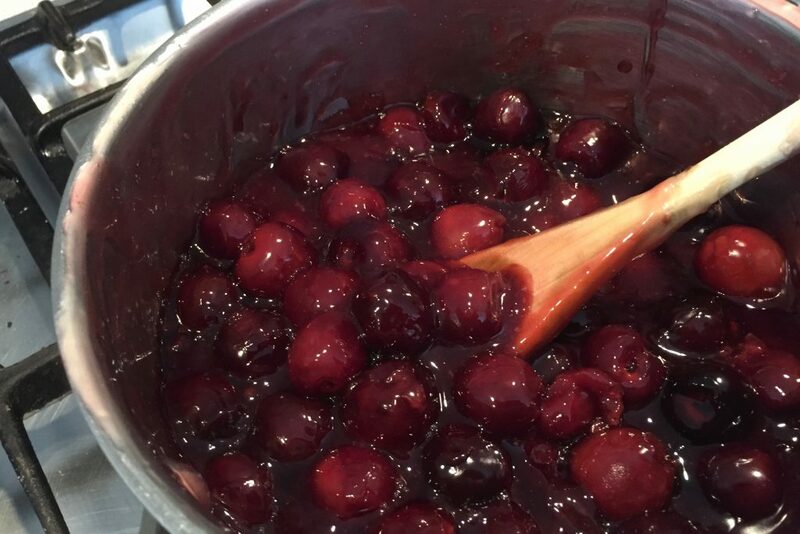 Know beforehand that the recipe has you cook the cherries on the stove-top before you add them to the crust. This really helps prevent the dreaded soggy bottom. I would do that a little ahead of time in order to let the cherries cool a bit. Also feel free to use your own favorite pie crust recipe but the one I provided is pretty darn good and always works for me. I use a food processor to make an all butter crust for this recipe. Check out this video if you would like a demonstration of the technique. Video- Making pie crust with a food processor. Pie Crust - Makes 1 crust. To make the all-butter pie dough. Measure out the cold water and store in the freezer while you get the rest of the ingredients ready. Cut up the cold butter into small 1/2 inch cubes. Place in a small dish and store in the refrigerator or freezer. Measure out the flour, sugar and salt and add to the bowl of a food processor. Pulse the processor a couple of times to mix the dry ingredients. See notes below if you do not have a food processor. Add the cold cubed butter to the flour mixture. Pulse the processor until the butter is in small pieces, about the size of peas. About 8 or 9 quick pulses. It's OK if a few of the pieces are a bit larger. Pour the ice water gradually through the feed tube while pulsing the processor just until the dough starts to form some large clumps. Stop and feel the dough. If you can squeeze a piece with your fingers and it sticks together, the dough is ready. The dough should feel cold and damp but not wet and sticky. Dump the dough on to a lightly floured counter top. Gather the dough into a ball and place on a piece of plastic wrap. Gather up the sides of the wrap to cover and press down on the dough to make a flat disk. Neaten up the sides so there are no cracked edges. Refrigerate the dough for at least 30 minutes before rolling it out. This chills the dough for a flaky crust and gives it a chance to relax. If you go longer than 30 minutes, it may get too hard to roll out. In that case, just let the dough warm up a little on the counter top for 5 to 10 minutes. On a floured surface, roll out the pie dough into a circle about 3 inches larger than your 9 inch pie dish. (About 12 inches) You want enough dough to bring up the sides of the dish and enough to make a crimped edge. Carefully place the pie dough into the pie dish and press in the bottom and up the sides. Do not stretch the dough. Trim excess dough so that there is a 1/2 inch of dough hanging over the sides. Crimp or flute the edges of the pie dough as desired. Store in the refrigerator until you are ready to add your filling. Video - How to make pie crust with a food processor. In a large sauce pan add the water, sugar, cornstarch and the salt. Over a low flame, stir the mixture with a wooden spoon until it starts to thicken. Fold in the pitted cherries and cook while gently stirring for about 5 to 10 minutes until the juices are red and mostly clear. At this point the cherry filling will thicken and go into a low boil. Turn off the heat stir in the lemon juice and almond extract. Let the cherry mixture cool. Add the rolled oats, flour, brown sugar and the 1/2 cup of sliced almonds to a food processor. Combine with a couple of short pulses. Add in the cold cubed butter and pulse until the mixture is crumbly. Pour into a bowl and rub the butter/sugar mixture with your fingers until it starts to hold together and you have some some clumps. Spoon the cherry filling into the prepared pie crust. Sprinkle on the crumb topping to cover. Sprinkle the remaining sliced almonds. Bake for 50 to 60 minutes or until the topping has turned a golden brown. Cool the pie on a cooling rack. 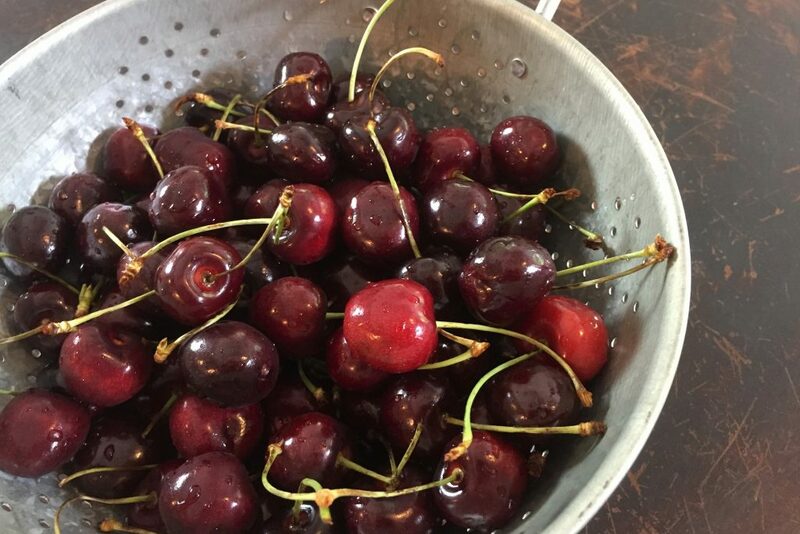 Use a cherry pitter to pit the cherries. You can make the pie dough without a food processor. Use a pastry knife or two knives to cut in the butter. Takes about 5 minutes. Video - How to use a pastry blender. 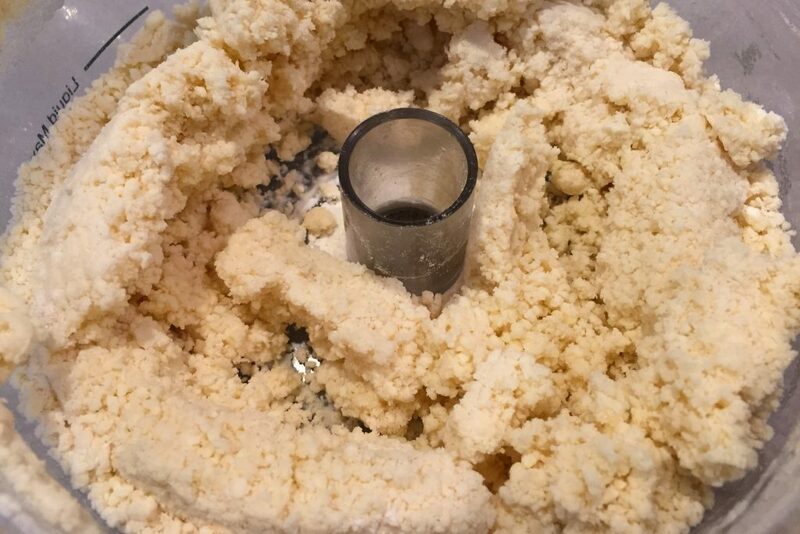 You could make the crumb topping without a food processor. Just put all the ingredients in a bowl and use your fingers to mix until crumbly. You may want to use quick cooking oats in this case.